News - Lotto Hero - From ordinary to extraordinary! Lotto Hero will take part at SiGMA iGaming exhibition in Malta. We will showcase Lotto Hero as part of Helio Gaming's family of games. Lottery is entering a year of revolution, writes Angelo Dalli, CEO of Bit8, which he hopes to usher in with his bold new "millionaire maker" product: Lotto Hero. Lotto Hero is due to return to ICE. Next month we will showcase our flagship game – and unveil a new suite of fabulous family members. The industry’s biggest annual event takes place at London’s ExCeL exhibition centre between 5-7 February. 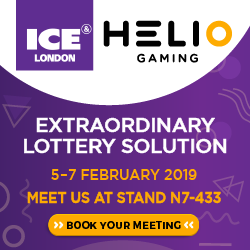 Helio Gaming, the parent company of Lotto Hero, will be present again. We will demonstrate just how effective the game can be. Existed lottery operators and those looking to tap into the lucrative vertical are more than welcome. This year the flagship product will be joined by the Hero family of games: The Daily Hero, Hero Millions, and The Big Hero. The first is an entry level daily draw. It gives players a taste for the quicker fire products. Then there’s a twice weekly draw with a highly competitive price/reward ratio. And finally a weekly chance to win massive jackpot. These games, along with Lotto Hero, which guarantees a jackpot of one million Euros on the hour, every hour, 24 hours a day, 365 days a year help acquire and retain loyal players. They also help reactivate lapsed ones by providing the chance for them to win millions. If you’d like to find out more about our Hero family of games, please visit ICE Stand N7-433. You can also book a meeting, or drop one of our staff a message on LinkedIn. For more information on Lotto Hero product or to speak with our CEO, Richard Mifsud, please contact Robin Hutchison at Square in the Air on robin@squareintheair.com.